WOW! It's amazing how time flies when you're having fun and that is exactly what I have experienced here at my lovely blog. I've met so many new people, from all walks of life and all over the world, each one bringing a little of their culture and lifestyle here, adding colours and more love to Wishing On A Falling Star. There are too many names to mention, but you know who you are. I love my Mariucans helluva lot and always try my best to entertain you with my posts, capturing your interest and support for me and my blog. So a big THANK YOU goes out to all my lovely friends, fans, supporters, members, readers and visitors. Without YOU to back me up, Wishing On A Falling Star will not be the blog it is today. And though I still have a long way to go in my blogging journey, I am proud of all my accomplishments thus far and will aspire to remain top-notch for your reading and blogging pleasure! As mentioned in a previous post, I've been preparing for this special day by giving both Mariuca and Mariuca's Perfume Gallery a makeover, getting a new banner for both blogs and of course planning a great contest to mark this special day. I hope u love this fluffy Teddy Bear as much as I do, cause looking at it sitting in my home office, right now, I too would love to make this Teddy Bear mine! 1. Be a true Mariucan and Subscribe to Wishing On A Falling Star. Leave a comment once you've subscribed. 2. 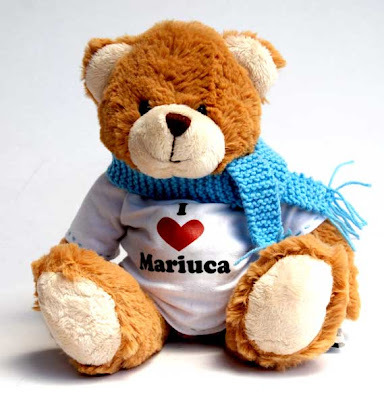 The Mariuca Teddy Bear needs a name so get creative and come up with the coolest one you can think of. 3. Post your entry at your blog, linking back to this post (and picture if you like) and tell Mariuca why you'd love to bring the Mariuca Teddy Bear home. 4. Leave a comment here with the link to your post once you've posted your entry. 5. International entries are allowed. 6. Contest runs from 3rd November - 3rd December 2008 (12 midnight Malaysia time). So what are you waiting for? You have a whole month to think of a special name and reason for wanting this adorable Mariuca Teddy Bear, to stand a chance to bring it home for YOU, a friend or a loved one! Don't forget to read the rules carefully; defaulting on any of the mentioned rules above will not qualify you to be listed as entries. * The Mariuca Teddy Bear was specially ordered by me from the creative Emila! Aiya!!! late by a few seconds!!! Congrats Nessa! woweee... I love the bear GP.. ok one whole month eh?? better start putting my thinking cap on... yihaas!!! That is one cute bear!! A contest!! This is exciting but I'm sure it's gonna be tough winning this bear. Tengok.. so excited.. forgots to wish you HAPPY ANNIVERSARY!!! wah 2 years.. eh..CONGRATSSS dearie.. and to many more years ok!! Wow.. You guys are so fast! love the bear, but I think I will have to pass.. I will follow closely though the contest. Hehe.. Can't wait to see who the winner will be! Hi Bono! and everyone else! Humiliating Battle of the Blogs defeat...I lost 14-1! I just joined a little one. Yahoo!! Thanks Debbie!! Mariuca's besday is finally here ha ha, happy it seems lol!! HaaziQ! Thank you for loving the Mariuca Teddy Bear ha ha, cute kan dia? LOL!! Thank you Bono, I love my Teddy Bear jugak ni! Try and win it for ur son woot! My daughter will like it. Here I am extremely late in trying for the FC spot. That Spiff fellow held me captive la ... LOL! that's one very love teddy! and Daryn wants one of those, but she is asking me to join the contest as she can't read and type anything now. LOL very creative indeed, and Emila did a fab job with the T shirt the bear is wearing! vote vote vote... good luck dearie..
sorry ah.. kurang social skg ni..sibuk lah...ttyl!! BOTB - voted! Good luck! Ha ha ha Jean!! You're so cute! I Love this teddy Bear oso la woman ha ha!! HAPPY BIRTHDAY MARIUCA. SEMUGA TERUS SUKSES BLOGGING. Congratulations!!! And Happy 2nd Anniversary!!!! Hope to take your Teddy back!!! Marzie thank you for the link. Marzie, haven't slept yet? I slept early and woke up at 3am. Eh I got Zenni opp at SR again la, for both RoTP and CnS! Lol!! Been procrastinating ni, which is bad, I know! :( Can't wait for my Ebay orders to come so that I can start making Christmas cards. I'm thinking of making some for sale. What dya think? You think people will buy ke? Cuz I've seen blogs of a few bloggers who actually sell handmade cards, seriously Marzie, card diorang tak lawa la, and selling for RM5 a piece! Jahat kan me? Hi Debbs! I oso slept just now, woke up almost midnite he he! Preparing invoices for my clients now. Wah good for u on Zenni, jahat la SR to me lol! HA HA ye ke?? Of coz u should sell cards oso, abaden!! U selling at Crafty? $5 jer la the Zenni opp. Anyway, yeah will be selling at CnS. See how la, I'll try to make a few and see what people say la. I'm kinda skeptical, though. Eh, don't listen to me. Negative la me these few days. It's contagious, I hope you had your shots! Lol!! Debbs, my first RM post was approved today YAY! Ha ha excited cause first time buat for RM. Nothing on BV as usual. Debbs, but RM must wait for 25 bucks kan? Sigh...baru 5 bucks je ni ha ha! Oh Marzie...of all days for every thing to be so mixed up and busy for me here at home and on the computer. Now I am so late in joining in on the celebration and saying Yayyyyyyyyyyy for you and congratulations!! Congratulations!!! and now we have to think of a name...ummm...that will take some thought. I hope you know just how much we all love you!! Marzie, if I'm not mistaken, less than $25 also can. $25 is for checks, not Paypal payment. But either way, you're earning with RM so yay!! I think it's that time of the month la. :( Dah la just now one blogger selling stickers actually sent me an email telling me not to spam her chatbox. I was like, wtf, she has separate chatbox, one for customers and the other for adverts. Maybe it's because I posted the same ad twice, once a few days ago and one more today. I'll be having one today when the race runs ...Mad Rush is a favourite Mariuca!! I'm backing the Aussie favourite Moatize who has a lady jockey..hehe..
ps ..isn't Nessa's avatar gorgeous !!! Debbs, ohhhhhhhhh...don let that get u down sweetie! I say u forget abt that email and concentrate on ur biz and ur blogs. If we let everything get to us, then for sure feel down, so just move on and don look back! Morning Kim! I'm just abt to go to zzzz now he he! I think I shall say PODAH to that person too. She doesn't dare to reply my email pun! Huh! Coward biatch! Yknow what, girly? The hell with those who are jealous and envious of us kan? Have a good rest, Marzie! Thanks for the public heart-to-heart. Lol!! I feel a lot better now. HUGS!!! oh GP!! i love the teddy bear and i love blue too!! let me think! let me think! I laik seeing my avatar there... hehe. Okie dokie I have to get running. I have drops to do and still another post. I will be gone almost all day tomorrow...so I won't be in until way late!! Yippee! Teddy is here! Happy 2nd Blogaversary, Marzie!! Wow! So many comments oredi! Been missing last night coz I fell asleep la!! Slept at 8pm, can you imagine that? Normally I would wake up around midnight but yesterday was a very tiring day and I selpt all the way till morning! haha! Congrats Nessa on being 1st! congrats lj on being 2nd! chop! CHOP! Yay, I'm the 106th commentator! Got the news from Bono! Happy 2nd Anniversary! I'm a mariucan now! Yeay! You are in my blogroll now! nick, takpe, you're here now! hi metz! love ur new template! love the colors too! the ec is lookin great! yay! saffa is mariucan now! yay anny will join too! nessa, yay! tulah, i pun dah lama tak dapat first tc ni! Now I am here. And I see you saw my post. I haven't been to mys site yet. but, I hope you like the post!! Oh I like all of the names so far. It will be hard for pick!! OMG!!! Marzie!! I have edited my post like you suggested and put up a name for the teddy and gave reason why I want it so badly!! Come read my updates of the post! what a great respond...I want the bear too!!! Hectic Election Day Tuesday here in the U.S. Speaking of voting, I just joined a Battle of the Blogs...I haven't seen your teddy post in BOTB yet, did I miss it? marzie!! thanks for the wentworth linky! muakksss! muakkss for you and muakkks for wentworth! Did I hear WENTY!?? Swoon!!!! Yo LJ!!! Wenty!! Best tak?!!! Haha! Wah Ken! Cayalah! Donnie tu! LJ!! Wenty macam sesuai je dgn bear tu kan? Ken, ok, your post good oredi! I am so excited to see this bear bear lar! so cute!!! *HUGZ* to yr bear bear!! aww... so comfy!! I am here to wish you all the best Mariuca, continue your great effort in blogging!!! You are so creative, come out with this creative contest. OK -- I've got my name picked out for the teddy and I'm going through the steps. 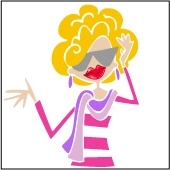 I have subscribed to Mariuca in my Google home page/Google reader. I have to get back to work, but I will move my BEAR-iuca post up to the top of my Roxiticus Desperate Housewives blog tomorrow morning (after Election Day) and see if I can win a big Battle of the Blogs with him smiling out at the world. I will also add my reasons for wanting to bring BEAR-iuca home to the Roxiticus Valley. Wow Roxy! Beariuca is a great name!! yay! am a step behind LJ on tc top 10! that's all i want! yeehaw! i hv visited few times b4 here n MPG but never dropped anything..
ehy, just letting u knw that, i hv already subscribe to MAURICA! yay! so0o.. do wait for my post for the bear ya! Hey, GP...thanks for all your visits today, glad you like the name BEAR-iuca! London and Maddie sure have their eyes on that cuddly guy, and want to get their hands on him! I think I will also post about BEAR-iuca on my Roxy's Best Of... Other People's Blogs, where I just added a short post about Wishing on a Falling Star. Just linked Bear-iuca from Roxy's Best Of... Other People's Blogs, but the link isn't showing up below your post, I don't know if that is supposed to be automatic, moderated by the Genie Princess, or just takes time, but BEAR-iuca is smiling out from Roxy's Best Of... on Election Day. Congratulations on another successful year!! You truly have a following and a community here. What a cute teddy bear indeed!! Congrats to Nessa for being FC!!! Looks like she got in just a tiny second before LJ. Ah LJ...slow and steady. I KNOW! I see you are off to a strong start for November already. Stopping by to drop my Bay Head Blog EC while I watch the election coverage on CNN. My 1st EC drop today...hope for GREAT day today. ALAKAZAM GK! Thanks so much for ur entry Adrian! I'm so pleased u could join in the fun here and you got ur post up in record time too, despite ur busy schedule! Hi Bobby! Thank you Bobby for your birthday wishes for Mariuca here and yes, that sure is one adorable Mariuca Teddy Bear! Anny!! I really love ur avatar la, the doggie is so fluffy and cute lol! Hey Metz! I see ur EC clearly now, seriously I simply could not locate it previously so I think I missed a drop or two then, but it's looking good in its new slot now so YAY! Emila itu! Thanks for being a great moderator for me yesterday ha ha! Senang sikit kerja I kat sini lol!! Hi LJ, I see u here too! Pandai la Emila tu pilih nama Wenty he he...and speaking of which, dah keluar ke blm PB ni???? Jean, thanks sweetie! I'm excited to have 7 entries already and of course I'm looking forward to yours. I know u will do your best cause I can tell just how much u adore this bear bear he he! Cute la this bear bear!!! Grandy!! GP is so happy to see u made it here! Thanks so much for the blogversary wishes and do join us if u feel like bringing this adorable Mariuca Teddy Bear home YEEHA! !